The winner will be selected randomly with Rafflecopter and announced here on the blog. I will give the name and contacts to Ecua-Andino staff so they'll contact the lucky winner and take care of the shipment. I will pick olive green. and I love the olive brown!!! I pick the gorgeous OLIVE BROWN, thank you. I'd like black or light brown, thank you! Quello verde oliva è bellissimo! Bellissimi davvero questi cappelli Valeria. Oh really cool Giveaway! Good Luck to Everyone! A me piace quello bordeaux! Great giveaway...I love the brown one! Ti confesso che a me i cappelli fanno venire mal di testa! Bellissimi questi cappelli! Un bacio. sono tutti bellissimi, ma preferisco quello verde!!! If I win, I would like the black one. Thanks! I think black would be best. it would go with everything. Uau, che belli! Il mio preferito è grigio! Il nome su rafflecopter è ovviamente Valeria! Ciao Vale! Ho visto la tua foto su Instragram e non sono riuscita a trattenermi! I want the black one, thanks. i like the brown one.. thanks! Light brown one would is great!!! Ok..I entered ;-). I like the dark green. Shelton Rogerson-The black would be nice. I love the kaki color one! Thank you for the chance! Hat obsessed, Lydia Abate would love it in black! blue is my favorite but isn't offered so brown I think. I would want a black one. Lisa V.
I love the Green so I would have to pick that one and now I am thinking hmmm pink coat, Olive green hat what an interesting combination. I like the brown. Entered as Katherine in rafflecopter. 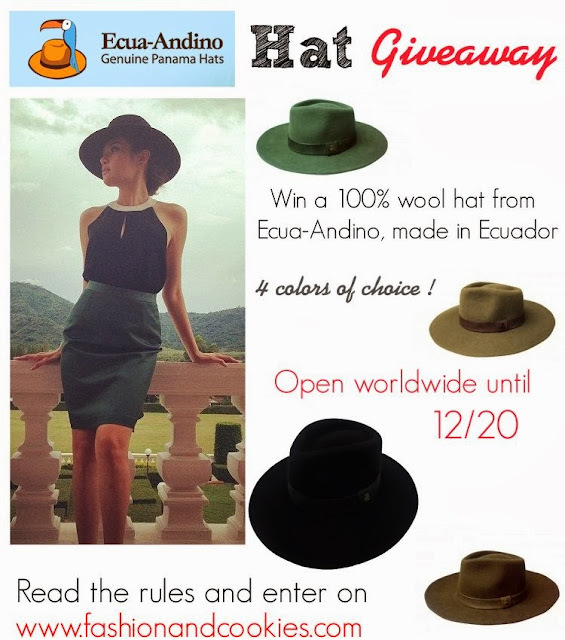 The giveaway is posted on http://i-giveaways.blogspot.gr/2013/12/enter-to-win-australian-wool-hat.html . Good luck to all!!! I would love the black. awesome. I love the australian light brown. I loved the black one and also the green is great!! I really love the light brown. I'd like the black one. I would love the olive green. Thanks! I think I would choose the black.